Pamper your body and your soul with the "Bloom Aromatherapy". This gentle oil consists of natural, certified organic ingredients that do not contain harmful pArabens, glycerine or DEA. The Bloom Mix .. Improve the appearance of your skin with the GLOV Skin Smoothing Body Massage Glove. Made using natural bamboo fibres, the massage glove helps to visibly improve the appearance of skin, smoothing.. Description: The nodules stimulate the lymph and blood flow helping to eliminate toxins that cause cellulite Combining flexible nodules with natural bristles there are multiple Health & Beaut.. Description: This luxury gift set comes in a green box printed with vintage drawings of pacific islands. It includes four items: A wooden stress spot Massager (to ease muscle fatigue), a natural p..
One side of the strap is woven sisal fibre - perfect for buffing away dead skin cells and boosting circulation. The reverse side of Hydréa London Sisal & Cotton Exfoliation & Massage Duo Str.. Description: he ergonomically designed Hydrea London Walnut Wood Cellulite Massager is a stylish massage tool that improves circulation and stimulates the lymphatic system to help remove the toxin.. Description Intimate Earth Relaxation Massage Oil helps to relax, unwind, and free your mind. It is beneficial for stress, muscle cramps, and tension. Our relaxing massage oil blend contains certi.. Description: Intimate Earth Sensual Massage Oil helps to create an intimate setting and frees inhibitions for both partners. 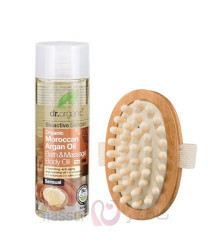 Our sensual massage oil blend contains certified organic extracts of.. Description: This ergonomically designed wooden cellulite massager stimulates lymphatic flow and blood flow stimulation. The rubber nodule massage action promotes the draw of fluid into the capil.. Description: OPAL RELAXOLOGY RELAX & PAMPER PACK OPAL JAPANESE STYLE BODY BRUSH: Made in the traditional Japanese way, this sisal brush gives a firm invigorating cleanse and is ideal for wet.. Description: Ease muscle fatigue and tension with this easy to use wooden roller massager. For use all over the body to tone and stimulate circulation ..
SCHOLL ROLLING SHIATSU MASSAGER HAND HELD..